Because Hagi ware easily absorbs precipitation through its tiny cracks, please pay attention to the following intstructions. Situated in Yamaguchi Prefecture on the Japan Sea, Hagi is a quaint town often called "Little Kyoto"' for its charm and old-style ways. 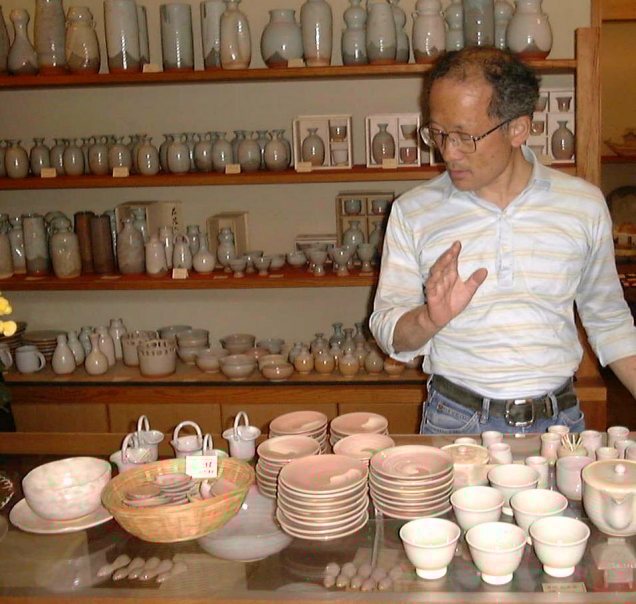 It is also the home of Hagi pottery, a ceramic style devoted exclusively to tea utensils. 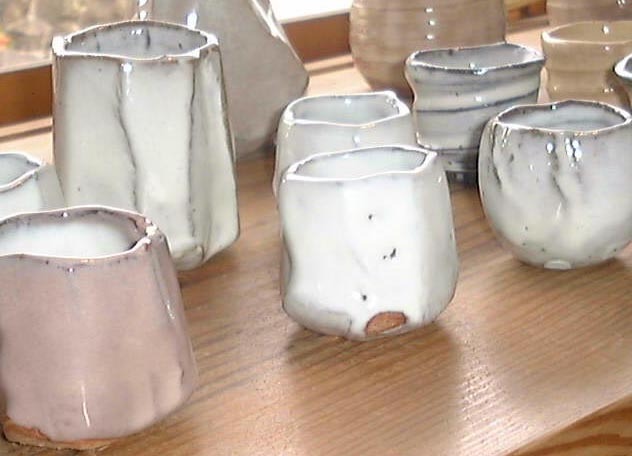 Indeed, Hagi is one of the only Japanese pottery styles that began purely as Tea ware. 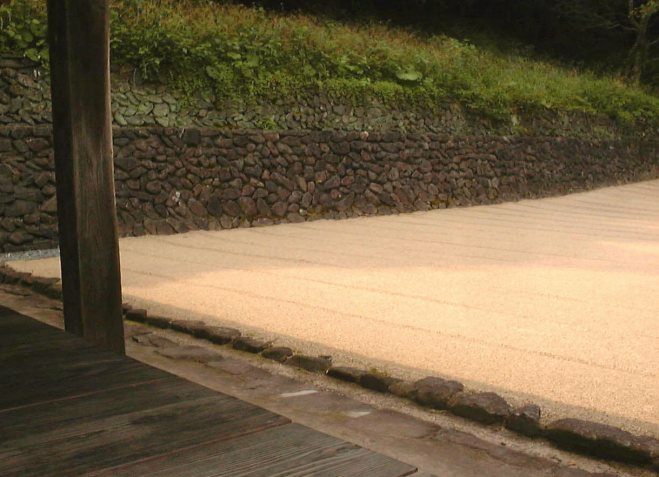 More about the history of Hagi can be found here. Instructions on using and cleaning Hagi ware are here. I recently made my first journey to Hagi. It does take a concerted effort to get there and I had to change trains at least three times from my starting point in Karatsu. Some of the train lines were so provincial that there was only one car and often they ran only once every two hours! Yet, the beauty of the journey through the mountains and seaside was often quite spectacular. 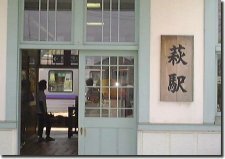 I imagined Hagi station would be like that of other popular pottery areas, with a gallery and gift shop selling the local crafts. Not so for Hagi though. The station is a one-story-one-room building that looks like it was built sometime around the Taisho Period (1912 to 1926). Unlike Bizen or Mashiko for example, there are no stores whatsoever around the station. It seems like a desolate place until one drives a little further into town. I stayed only one night at the fabulous Tomoe Ryokan. 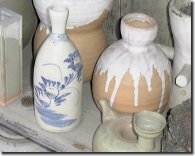 Hagi pottery is seen all over inside the ryokan (inn) and they have a small museum featuring works by the three Miwa brothers: Ryosaku, Eizo, and Kazuhiko. Members of the Miwa family also did much of the displayed calligraphy. The ryokan's name, for example, is prominently on view above the front counter -- it was written by Miwa Kyuwa. The Okada and Kaneta kilns date back eight generations and were appointed by the then-ruling Mohri family sometime around 1782. Earlier Hagi families are the Miwa, Sakata, Saka, and a few others that were appointed about four hundred years ago and are now into their twelfth generation or more. 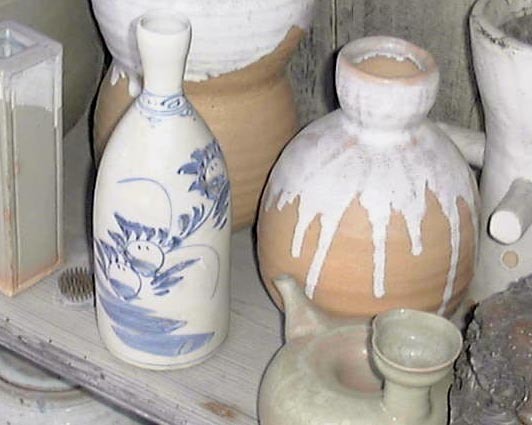 In the late Edo Period (1603 to 1867), the Hagi kilns even made porcelain, but soon abandoned it due to the popularity of Arita and Seto porcelains. 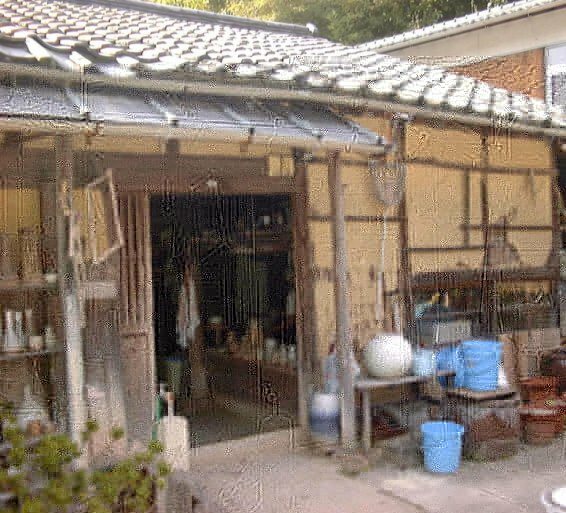 In front of the 200-year-old Okada workshop, one can see some of those porcelain pieces mixed in with many other Hagi works from the eight generations of Okada potters. During the Meiji Period (1868 to 1912), as with other kilns, ornamental figures were popular and many were made at the Okada kiln (see Fukurokuju photo below). 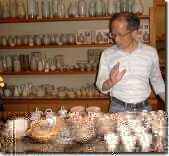 "In the Keicho era, approximately 400 years ago, the Lord Terumoto Mori invited two Korean brothers, named Li Shao Guang and Li Jin, to settle down in Hagi and introduce Korean pottery and its technique from the Koryo Dynasty (Korai in Japanese, 918-1392 AD). 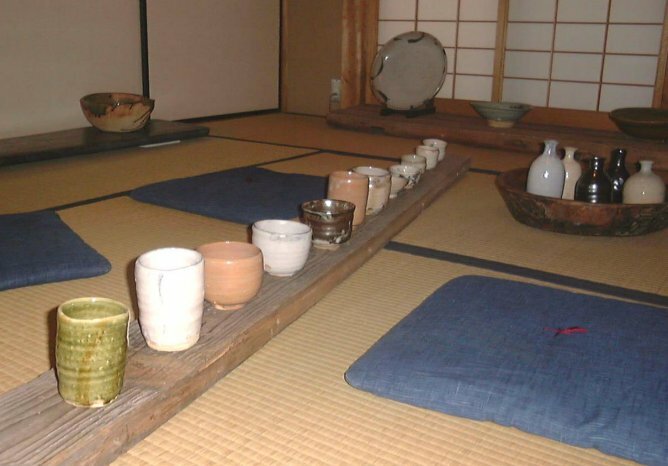 The Korai pottery was highly appreciated by tea masters for its natural and simple beauty. 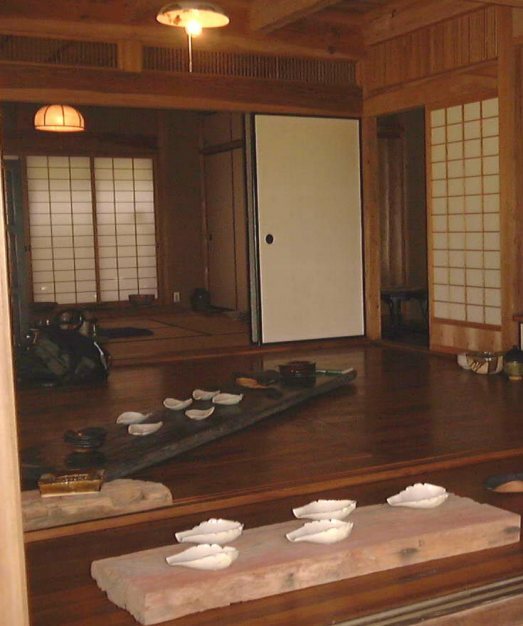 The two brothers' groundwork eventually developed into the well-known Hagi-yaki, predominantly as a ware for the tea ceremony. 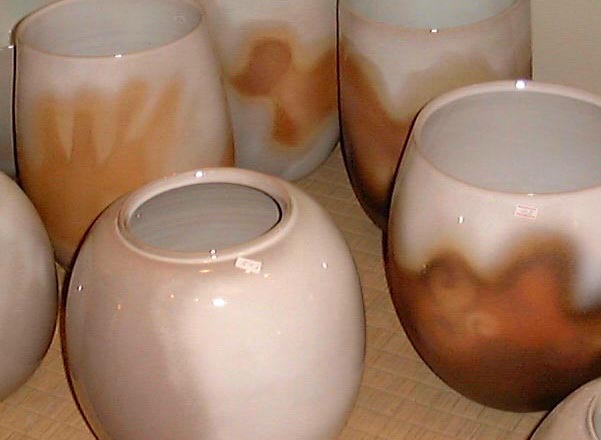 Hagi pottery is a slightly porous stoneware. During use, it absorbs the tea and stains the ware, resulting in a fine netting of cracks to appear on the surface of the glazing. It is said that the tone within the color of the ware will change "seven times" (Hagi-no-Nana-Henge), and this turning of colors is highly appreciated by collectors. 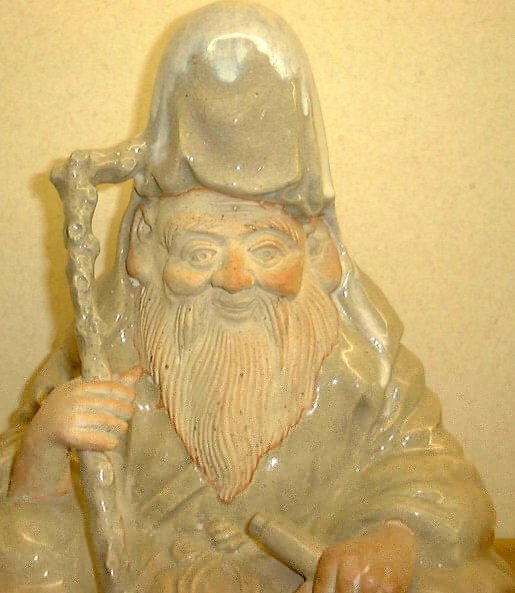 Gonzaemon, the founder of Seiunzan kiln, was born in Hizen, Saga prefecture.  To study pottery, he traveled widely around Japan. 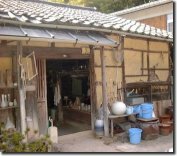 He liked the Hagi ware and town; so much, in fact, that he decided to build his house and kiln in Maeobata, an eastern suburb of Hagi, in 1782 AD. He also studied porcelain, and tried as well to produce the Annan style of china. 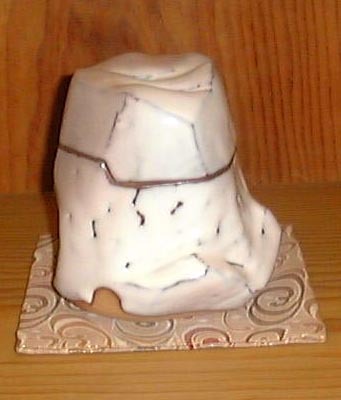 Gonzaemon dedicated his pottery to the Lord Narifusa Mori. Lord Mori appreciated his work greatly, and ultimately promoted Gonzaemon to the stipend-receiving rank of Samurai in 1796. Since the foundation of the first kiln 200 years ago, the Okada family made much effort to carry on the tradition and improve the pottery making of Hagi wares into the present day. Senshu, the seventh generation head of the Okada family, passed away in January 2003. To this day, we use the seal and name of Senshu and Seiunzan on our pottery, to honor the Okada family name and technique. " 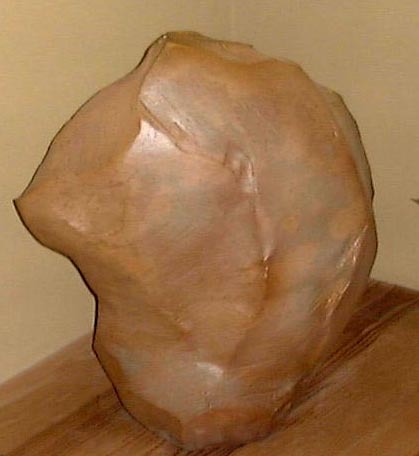 Yutaka's work is quite traditional and has a most pleasing beige glaze that he uses with the famed daido clay (in Hagi, a gritty clay known as daido clay reigns supreme). His Ido chawan (well-shaped) are especially notable as are his fine white tsubo, as shown below. Yutaka has won many awards over the years including the Yamaguchi Prefectural Cultural Prize in 1998, and various others at the Tanabe Museum's Contemporary Tea Forms Exhibition and the Japan Traditional Arts and Crafts Exhibition. 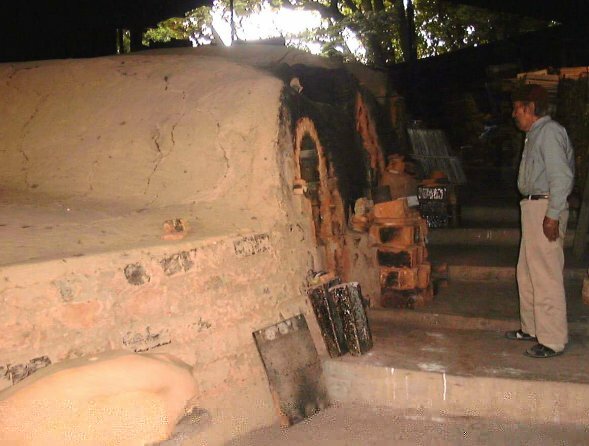 Just up the road from the Okada kiln is the Kaneta kiln. 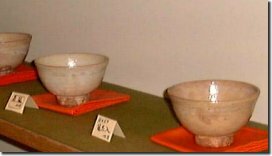 It, like the Okada kiln, has a production line of standard Hagi teacups and such, as well as the very distinctive work of Kaneta Masanao. His work has expanded Hagi's Tea world with boldly sculpted forms that come in small sake cups all the way up to large installation forms. His koro (incense burners) were quite stunning as were some of his vases. He's also had a highly decorated career and now spends a few days each week teaching at university all the way up in Ibaraki Prefecture! I wonder how he finds the energy to continue on with his quite demanding forms. The day we visited Kaneta was teaching, but his father, the seventh generation Sanzaemon, was kind enough to guide us around the pottery. Below is a photo of him standing in front of the kiln. His work is very traditional and focuses exclusively on Tea utensils. Our third and last potter is the ever-talented Hamanaka Gesson. 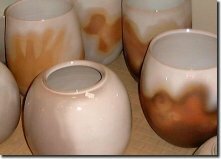 His work is a blend of Hagi with different clays and glazes, such as Shigaraki and Oribe. Many pieces were dislayed quite dramatically throughout his splendid home. Each room was full of his beautiful works along with wonderful screens and hanging scrolls. In his Tea room was one such scroll, a Korean Yi Dynasty one picturing a very relaxed tiger. I would go as far to say that his works are the closest to a modern day Rosanjin as one gets. Another joy was gazing upon his meditative rock garden (see above photo). There is much more to see in Hagi and I do look forward to my next visit. Hopefully it won't take me another seventeen years to do so.